coming up on Weds., Nov. 12th in NYC. contribute something special to prisonist.org. Recently, I was invited to serve as a member of NYS Governor Andrew Cuomo’s Reentry and Reintegration Council. I was both humbled and troubled at once: I was humbled because as a man whose youthful past includes serving six years in a New York State correctional facility, I recognize how fortunate I am to simultaneously lead JustLeadershipUSA (www.justleadershipusa.org), serve on a number of non-profit Boards, wear various other leadership hats and speak as a member of several different communities. I was troubled because so many formerly incarcerated people—in fact the vast majority—has never had the opportunity to develop their potential. The creation and launch of JustLeadershipUSA is my attempt to end that pattern of alienation and oppression now. For me, exiting prison in 2000 was a rebirth. I wanted to be great. I knew I was developing a distinct voice that if fully realized, would become resounding enough to make a difference. But where was my platform? And even if such a proverbial platform existed, how would it develop? So began my journey. Much of what I’ve accomplished thus far can be attributed to the compassion and generosity of my friends, family and colleagues, self-education, leadership training, sound mentoring and exposure to opportunity. Periods of reflection have allowed me to be both appreciative of my achievements and critical of the many barriers that have surfaced along the way. JustLeadershipUSA is the culmination of such reflection. We are dedicated to cutting the US prison population in half by 2030 while reducing crime. JustLeaderhipUSA empowers people most affected by incarceration to drive policy reform. To realize our vision and achieve our goals, we develop and support formerly incarcerated leaders, build and sustain an engaged national membership and rive policy advocacy efforts on the federal, state and local levels. The idea that communities and individuals impacted by incarceration and our criminal justice system will now have a formal space dedicated to tapping their potential to become leaders in reform efforts brings me hope that we will finally achieve deep, sustainable change in our criminal justice system. I carefully considered the principles that must guide such an organization. JustLeadershipUSA has learned a great deal from the vast criminal justice institutes, think tanks and social service programs that currently exist. However, it also dares to put new and authentic drivers in the seat of the reform locomotive. It is time for those closest to the problem to rise up and lead us all down the path out of our problems. No community wants, or needs, true reform to occur more than the ones directly impacted by a failed criminal justice system. Why, then, are we not seeking their advice about what needs to change, where we can improve, and what strategies do we need to implement to actually see such change? 50 years after Dr. Martin Luther King’s “I Have A Dream” speech, America has gradually expanded the definition of justice and civil rights. Led by King’s vision, and the sweat of many other social engineers, many groups that were once disenfranchised and ignored now have a place behind the podium. One’s sexual orientation, gender identification, ethnicity, or immigration status does not automatically preclude one from playing a significant role in one’s destiny. JustLeadershipUSA is not an expansion, but a recognition of King’s vision of a nation composed of equally empowered citizens. Our incarceration system was built on the flawed thinking that “lock ’em up and throw away the key” would solve all of our public safety problems. But as King insightfully highlighted, we are all patches in this quilt called America, woven together by both our victories and our injustices. Repositioning the patches of the millions of Americans impacted by the criminal justice system is JustLeadershipUSA’s “call to action,” and an important step toward his dream being realized. I acknowledge that my success is also tied to my failures; that I am invited to circles largely because to many of my colleagues I represent an “exception,” rather than the rule. But my life is dedicated to changing what we have accepted as the “norm.” JustLeadershipUSA seeks to provide a space for those for whom society has no room; time for those for whom we have no time; a voice for those whose cries have been muffled and muted. JustLeadershipUSA aims to serve as a vehicle for millions who aim for the same rights and opportunities as their fellow Americans: life, liberty, and the pursuit of happiness. 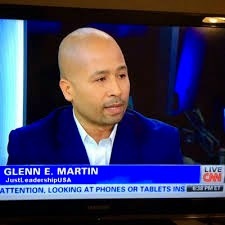 GLENN E. MARTIN is the Founder and Chief Risk Taker of JustLeadershipUSA. (JLUSA). Glenn is a national leader and criminal justice reform advocate who spent six years in New York State prisons. Prior to founding JLUSA, Glenn served for seven years as Vice President of Development and Public Affairs at The Fortune Society and six years as Co-Director of the National HIRE Network at the Legal Action Center. Glenn is Co-Founder of the Education from the Inside Out Coalition, a 2014 Echoing Green Black Male Achievement Fellow, a 2012 America’s Leaders of Change National Urban Fellow, and a member of the governing boards of the College and Community Fellowship, Prisoners’ Legal Services, the Petey Greene Program, the Reset Foundation, the New York Foundation, and California Partnership for Safe Communities. Glenn also serves on the advisory board of the Vera Institute’s Public Health and Mass Incarceration Initiative, the National Network for Safe Communities and the Executive Session on Community Corrections at Harvard Kennedy School. Glenn regularly contributes his expertise to national news outlets such as MSNBC, Fox News, CNN, Al Jazeera and CSPAN on topics such as policing, decarceration, alternatives to incarceration, and reentry issues.